Welsh naturalist Dr. Mary Gillham of Cardiff University had a special relationship with Ireland and some of the accounts of her visits have lovely turns of phrase – both eloquent and humorous. Inspirational coastal vegetation on Cape Clear, Ireland. Mary Gillham made specific trips to Cape Clear, The Skelligs, Garinish Island, The Aran Islands, Inishbofin and Achill Island. The photographic records of these visits are available on flickr thorough the Mary Gillham Archive Project. You can enjoy more of her descriptions of her trips to Ireland in: Gillham, M. (2007). This Island Life. Discovering Britain’s Offshore Gems. Halsgrove. The story of Dr. Kathleen Carpenter (1891-1970), pioneering freshwater ecologist in Wales, has been emerging over the past two years based on the joint research of Catherine Duigan and Warren Kovach. The day after International Women’s Day 2017, you can hear about their latest discoveries at this lecture in Bangor University. The lecture will pay tribute to Carpenter’s scientific achievements, consider the personal, social and academic challenges this exceptional woman must have faced and develop her as a role model for young scientists today. documented the presence of glacial relic species in Britain. Just before World War 2 she returned to Britain to complete her career at Liverpool University. Dr Kathleen Carpenter has earned the title of “the mother of freshwater ecology” and she was also probably our first Welsh freshwater conservationist. Developed with the assistance of the Carpenter/Zimmerman family and using material from The National Library of Wales, Aberystwyth University Archives and Natural Resources Wales. Dr. Sarah Davies provided the encouragement and opportunity to first bring the story to public attention at Aberstwyth University in 2016. Kathleen Carpenter realised that the lack of a British freshwater textbook was a career defining opportunity for her. It is evident that her Ph.D. thesis at Aberystwyth University formed the basis of her seminal textbook, Life in Inland Waters. It opened the door to an international career for her in North America. She first travelled there in 1924 for a meeting of the British Association for the Advancement of Science in Toronto, and presumably during this visit she visited the Biological Department of Toronto University. She returned to Britain for her final professional appointment as a lecturer at Liverpool University just before the outbreak of World War II. Today the 5th edition of one of the most universally popular freshwater textbooks, Ecology of Freshwaters by the late, great Prof. Brian Moss, also of Liverpool University, is going through the final stages before publication. Kathleen Carpenter and Brian Moss shared a passion for the biodiversity of aquatic ecosystems. Together these two freshwater giants have secured an ever lasting place on the academic textbook stage – inspiring generations of students. The paired doorway characterises Old Bank House, a historic building, on Bridge Street, Aberystwyth. The 6 panel split door on the left must have been opened wide for bank customers. While the young assistant lecturer Kathleen Carpenter would have looked down past the edge of her skirt to step up to the right-hand door leading to her accommodation. She would have had a short walk through the sheltered back streets to the library and science laboratories in Old College. Plaque on Old Bank House. Old Bank House, a late Georgian building, was the first bank in Aberystwyth, and possibly in Wales. It opened in 1760 and was established to serve the local maritime community. It was eventually taken over by the North and South Wales Bank which in 1870 moved to another site. The house was subsequently divided up as University accommodation. Record of Kathleen Carpenter’s address and salary in Aberystwyth University Archives. Shortly before Kathleen Carpenter lived there the building had been a temporary Red Cross Hospital for recuperating World War One soldiers before it was moved to a larger building, The Cambria, opposite the pier. The influx of soldiers must have changed the character of the town for its residents, and especially its young women. By December 1914 there were almost 9,000 troops in and around the town, and a substantial number of refugees. The convalescing soldiers, many of them gas victims, recovered by taking the sea air and funds were raised to buy a rowing boat for their recreation. There were numerous fund raising events to support the hospital and war efforts, including football matches, concerts and Christmas fancy dress parties. Romances blossomed between the soldiers and local girls. But here were also war time tensions. In August 1914 a German lecturer at Aberystwyth University was given 24 hours to leave to the town by a large mob which gathered in front of his house. Three months later Kathleen changed her German surname from Zimmerman to Carpenter. In 1917 Dr. Fleure invited the patient soldiers to visit the Museum in Old College. It would have been an opportunity for Kathleen Carpenter to be on hand to explain some of the exhibits but did she do so? The Spanish Flu epidemic reached Aberystwyth in the autumn of 1918, with the remaining convalescing soldiers not allowed to visit private homes and some local businesses closed due to lack of staff. Kathleen Carpenter would have seen the world change around her when she lived at Old Bank House. As a young woman she would have realised the opportunity to contribute to society in new fields opening to women, including science. At Aberystwyth University women students were in the majority during World War One, with men returning to dominate after the war. With a German born father she would have been acutely aware of the politics; and perhaps have felt vulnerable but relatively safe in Aberystwyth? I would also like to think she enjoyed some of the social occasions. I am grateful to Julie Archer, Records Manager at Aberystwyth University Archives, for the record linking Kathleen Carpenter to Old Bank House. Thank you Julie! Ellis, E.L (1972). The University College of Wales, Aberystwyth, 1872-1972. University of Wales Press. Troughton, W. (2015). Aberystwyth and the Great War. Amberley Publishing. 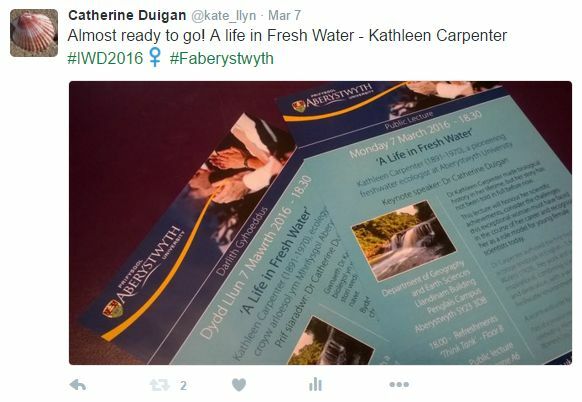 Did you know Kathleen Carpenter, freshwater ecologist? We have found only one personal account of Kathleen Carpenter, pioneering freshwater ecologist. She is sitting in a garden in Birkenhead eating cucumber sandwiches and discussing with her neighbours the recent outbreak of World War 2. It is a beautiful day but barrage balloons float overhead. Poignantly it is also one of the last references we have for her, as her scientific career does not seem to extend beyond the duration of the war. However she lived until 1970, so it is possible that there is somebody still alive who may have known her during the final part of her life which she spent in Cheltenham. For this reason we have sent the letter below to the Gloucestershire Echo. Please feel free to tweet this blog or direct others to it, if you think they might have known Kathleen Carpenter or her sister Bessey. It is an exciting prospect to think we might talk to someone who talked to Kathleen! Hope you can help. “We are researching the life of a pioneering woman scientist named Kathleen Carpenter, who was living in Cheltenham when she died in 1970, aged 79. She was born in Gainsborough, Lincolnshire, but her love of science took her around Britain and the USA. She was one of the first women scientists in Britain to study (in the 1920’s and 1930’s) the ecology of animals in rivers and lakes . She studied and lectured at Aberystwyth University before moving to America, where she taught in Illinois, Massachusetts, and Maryland. She returned to the UK to lecture in Liverpool during World War II. We don’t know when she moved to Cheltenham, but she was living at Norwood, 39 Leckhampton Road, when she died in 1970. She may have earlier lived at Douglas House on Parabola Road. She never married, but was close to her sister, Bessey Adams, who also lived in Cheltenham. Bessey was a widowed former school headmistress from Stockton-on-Tees, who lived at 138 Leckhampton Road when she died in 1974, aged 93. We would be very pleased to hear from anybody who might have know either of these two accomplished women. We can be contacted at warrenk@kovcomp.com. One of the pleasures of biographical research is finding personal insights. This has proven to be elusive in the case of freshwater ecologist Dr. Kathleen Carpenter who left a trail of scientific studies in the early half of the last century but few accounts exist of what she was like as a person. However one of my work colleagues has shared with me his admiration for his inspirational teacher Dr. Mary Gillham, a more recent Welsh based ecologist. Her papers, photographs and diaries are currently being curated as part of a special project – A Dedicated Naturalist: The Dr. Mary Gillham Archive Project. Mary Gillham visited many of the classic natural history sites in Ireland between 1963 and 1988 – The Burren, Connemara, Killarney and several offshore islands, including Inishboffin, Achill Island and Cape Clear. I could not resist asking if I could see some of the material from these trips with her extramural students from Cardiff University. I did not expect to find an abundance of donkeys! The slides from almost every trip to Ireland include donkeys and her island guide book describes her enjoyment of these surprise encounters. This blog reunited her descriptions of these encounters with photographs she took at the time. Recent DNA studies have revealed the far away origin of the donkey and the length of the relationship with people. Their ancestors were first recruited and tamed by people in the deserts of North Africa more than 5000 years ago. Ancient trade routes and civilisations were supported by these faithful animals. Donkeys have come a long way but their joint journey with the people of Ireland is set to continue. With my sincere thanks to Annie Irving (@sconzani) and Al Reeves for their assistance with the production of this blog. You can follow follow progress with The Mary Gillham Archive Project on Twitter and Facebook. It was a beautiful drive to Aberystwyth on the day, although we were surprised to encounter snow down to the margins of the road between Maentwrog and Trawsfynydd. The study area for Kathleen Carpenter’s Ph.D. extended up to the Afon Dyfi so it seemed appropriate to stop after we crossed the Dyfi Bridge outside Machynlleth – Carpenter Country. We spent part of the afternoon talking to Sarah Davies and making last minute preparations. At 1800 the audience started to arrive for the reception. There was an air of anticipation…. On International Women’s Day, Dr. Kathleen Carpenter provided advice to the next generation of women freshwater biologists via The Freshwater Blog. You can read the blog Kathleen Carpenter: Mother of Freshwater Ecology here. This blog generated tweets around the world and allowed her to truly claim the title “mother” of freshwater ecology. From Ireland, Switzerland and Germany…. It was very appropriate that some of the tweeters were women professors of freshwater ecology, Ph.D students and researchers, and conservationists in North America because Kathleen Carpenter went on to hold research and teaching positions in the US. You can listen to her book preface here. We know Kathleen Carpenter was a member of the British Ecological Society, so thank you BES! On International Women’s Day we walked in the footsteps of Kathleen Carpenter in Old College, Aberystwyth University, where she studied. Hopefully she will feature in future accounts of the history of the college. The lecture reviews were kind. You can read this review in full here and it made all the research and preparations worthwhile. Thank you so much @FriendlyBugBlog. The weekend before the lecture we set up a Wikipedia page for Kathleen Carpenter, following a suggestion by Prof. Hilary Lappin-Scott. Within two weeks it had hundreds of views. On International Women’s Day, Prof. Lappin-Scott launched a Welsh Government Report on women in science in Wales – We need to recruit, retain and promote women in science, technology, engineering and mathematics (STEM). We also made links with two other important projects researching the lives of British women ecologists who worked around the world. The project, Women Freshwater Biologists (1929 – 1990), is part of a wider initiative to archive the collections of samples, correspondence and research of scientists who have worked with the Freshwater Biological Association (FBA) based on Windermere. Love this picture! Although there are photographs of FBA women working in skirts, Winifred Frost (circa 1950) is being practical and comfortable in her boots and trousers. Dr. Mary Gillham of Cardiff University has written books on the environmental history of the river valleys of South Wales and the nature of Welsh islands. Her diaries, papers, photographs are the subject of the Mary Gillham Archive Project (@GillhamArchive). The research on Kathleeen Carpenter has not stopped, with a new clue that she was at McGill University in Montreal. But there is also more to find out at Aberstwyth University. The story continues and we will share our progress on this blog.